Browse: Home / 2014 / February / 25 / NASA Photo Confirms North Korea Only Country That Is Really Taking Climate Change Seriously, Acting Responsibly! The North Korean decarbonized zone. NASA photo taken by the International Space Station (ISS), acquired January 30, 2014. 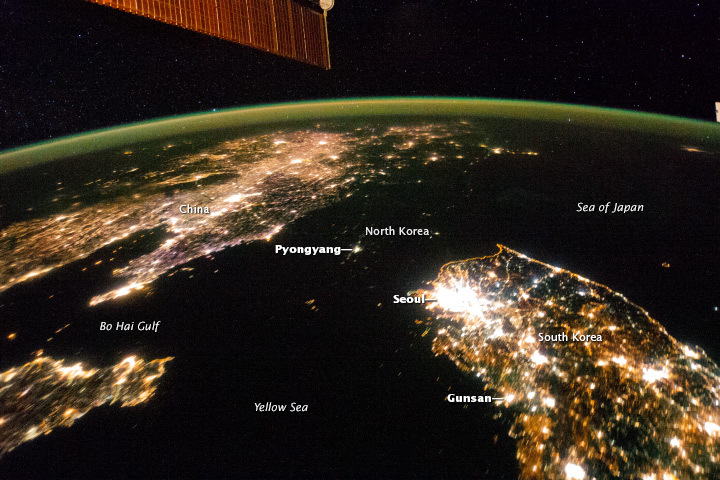 Astronauts on the International Space Station (ISS) took the above shown night image of the Korean Peninsula. NASA writes that the light emission from North Korean capital Pyongyang is equivalent to the smaller towns in South Korea and that differences are illustrated in per capita power consumption in the two countries, with South Korea at 10,162 kilowatt hours and North Korea at a resp0nsible 739 kilowatt hours. It’s time for the global warming alarmists to nominate North Korea for the Nobel Peace Prize. In fact, with all the worldwide conferences and jet-setting, the carbon footprint on the planet by 2007 Nobel Peace prize winners Al Gore and the IPCC, and all the delegates globally, probably exceeds that of the entire North Korean country. Oh dear. I do hope NASA realise that the people unfortunate enough to live under a dictatorship actually want out. I hope they don’t seriously think the North Korean model is what we should be aiming for. ), they have never suggested we become like NK. Yeah, dirk, I kinda got that, but thanks for the clarification. I’m kind of guessing that you missed the dry, British sense of sarcasm in my post. That’s the outcome that the global warming Nazis want for you … we know that the models are inconsequential.